When the Becton Dickinson Corporation expanded its Franklin Lakes campus to include a new Center for Research and Development, Singer was asked to design the exterior courtyard associated with the new building expansion. Singer had previously completed two interior atrium spaces within the original headquarters building. The new exterior garden was conceived as an extension of the previous work, incorporating related forms, materials and detailing of the Atrium Garden. Upon entering the Center there is a view of the Courtyard Garden framed by the east and west wings of the building. From the building the land slopes downhill towards the woodlands beyond the garden. The garden merges a series of low stone retaining walls and stepping terraces with the gradual slope of the ground towards the adjacent woodlands. 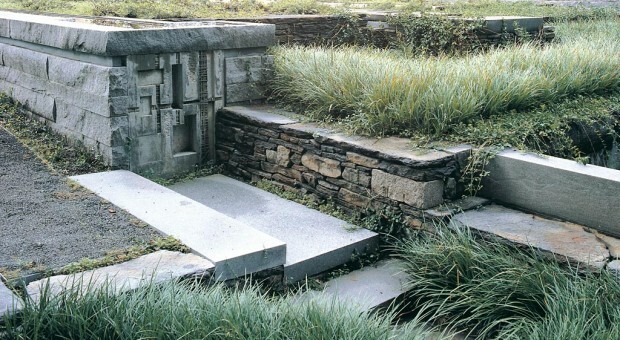 There are sculptural elements both below and above the ground level of the terraces, as well as water pools supplied by a channel adjacent to the garden pathway. The water in this channel collects in the lowest pool where it gently falls into a cistern, eventually returning to the upper-most terrace water source. The final cistern is formed as a well with a sculpted granite cap; the composition of the well and cap are designed to echo and enhance the sound of the water, giving it a strong presence within the garden. Due to the multiple terraces of the sculpted ground it is difficult for a person standing within the garden to see all aspects of space. Only when the large courtyard is viewed from offices on the upper building floors surrounding it are the overall garden and sculptural details revealed as a whole.